Home / Pattern Reviews / A Tilly and the Buttons Delphine Skirt – the first of many. A Tilly and the Buttons Delphine Skirt – the first of many. It’s taken me way too long to make this Delphine skirt! I have had the book Love at First Stitch on my bookshelf for such a long time and whilst I have good intentions of making up all of the patterns, I clearly keep on getting distracted with other garments! This week it’s my turn to write a post as one of the Sewisfaction Blogger Team, and so whilst I won’t go into great detail here, I will leave a link to my full review on the Sewisfaction blog so that you can hop over there and read all about it. I so love the fabric that I chose to make the skirt. It’s a medium weight Japanese cotton canvas fabric, and has a bold retro floral design set against a dark blue background. Other than shortening the length, I only made one change to the pattern, and that was to swap the invisible zip for an exposed one. I’m really loving these exposed metal toothed zips at the moment and want to add them to everything! So I’ll let you head on over to Sewisfaction if you would like to know more, and in the meantime, as the weather is freezing here at the moment, I shall be reaching for my cosy tights so that I can continue to wear my Delphine despite the temperature. Previous post: The Paola Turtleneck Tee. What a great skirt Kathy – you look lovely! The proportions are perfect – I am 5’3” and usually have to alter patterns so its great to find this one. 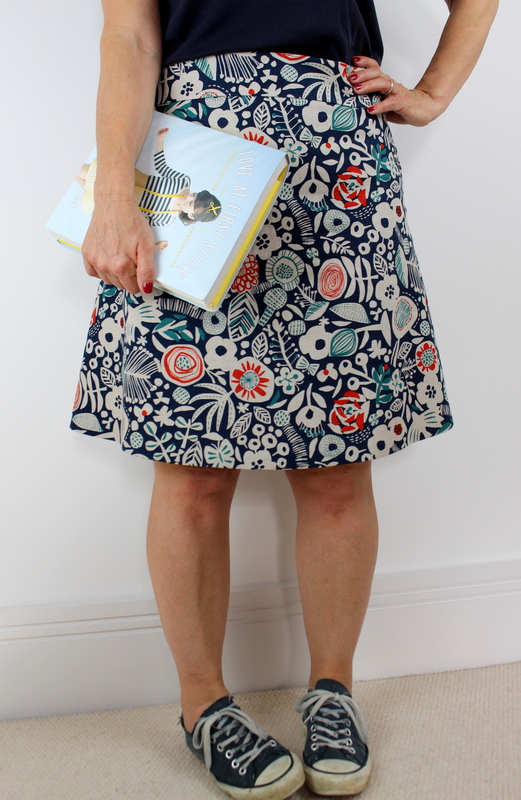 The fabric really suits you too – altogether a great sew! It looks lovely, I really like the exposed metallic zip.